Looking to do some baking with your kids using some easy cookie recipes for kids this Christmas? These Christmas cookie recipes for kids are the perfect place to start! Some of my favorite holiday memories as a kid is baking cookies. My mom and I would make a list in early December of all the cookies we were going to make, buy ingredients, and then on her day off we would bake for hours. We would end with – no joke – thousands of cookies. They would get separated, packed into tins, boxes, and bags, and dispersed among friends, family, teachers, hair dressers, the mail man – really anyone who we ever encountered that was kind. It’s one of the memories that I want to share with my own kids. This Christmas will be the first that I feel pretty comfortable letting Ryan help me bake and ‘take on’ some tasks of his own rather than do the holiday baking while he sleeps. me easy cookie recipes for kids to try that would be perfect for getting little hands involved. Obviously, you can always have your kiddo stir in some ingredients or count out items when measuring, but if you’ve ever encountered a stubborn 3 year old, you’ll know that just ‘helping’ never works out well. It always ends in, “I can do it myself!” and if the step they want to do isn’t SUPER kid friendly, it never works out well. 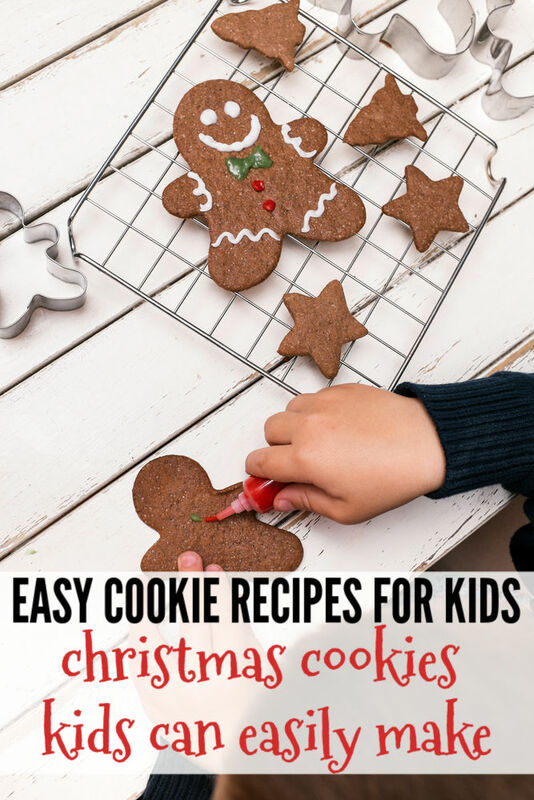 So I put together this list of easy cookie recipes for kids that have very kid friendly steps – your kids are going to love knowing that they had a huge hand in creating holiday cookies for loved ones and you’ll be happy to create holiday memories without the power struggle! 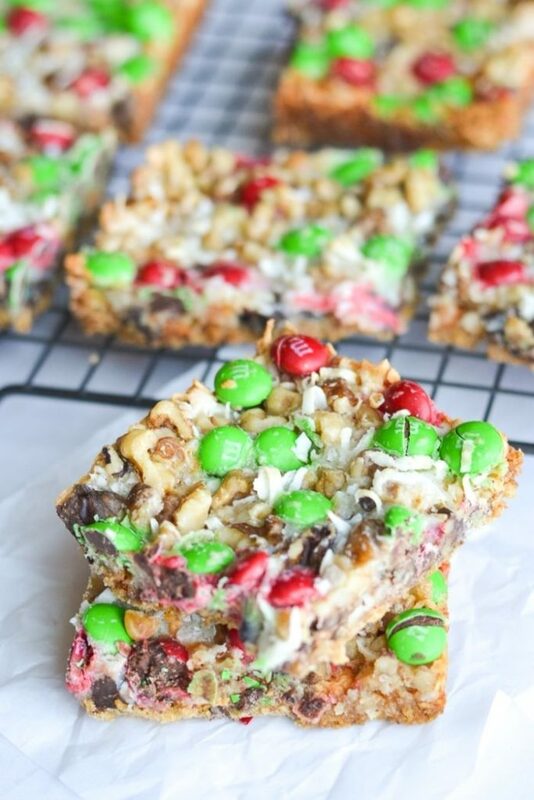 These Christmas Magic Cookie Bars look so amazing – not only are they delicious and super simple, your little can pretty much assemble the entire thing by himself. Mom or Dad will only need to put the pan in the oven, take it out, and cut the bars. How fun! Head over to Typically Simple to find the recipe! 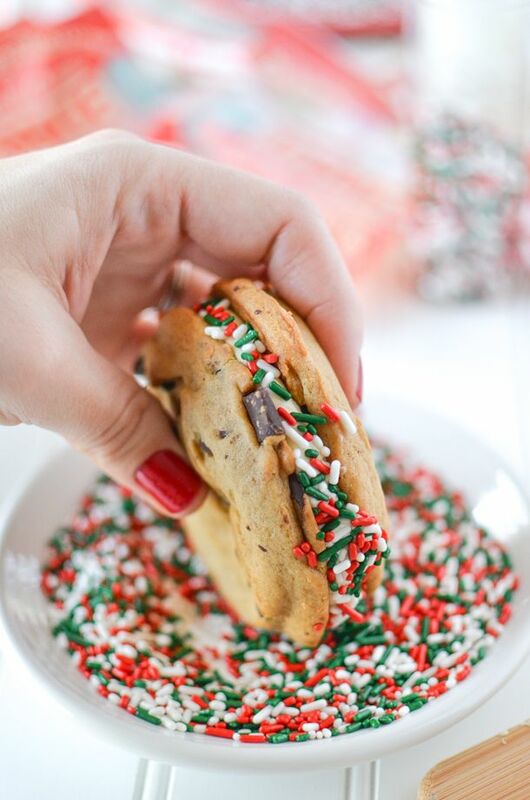 File this one under, “I like baking with my kids but ain’t no body have time for that!” Simply make the peppermint filling, sandwich between big, pre-made cookies, and roll in sprinkles. Kids would love to press the top cookie on the sandwich or roll the sides in sprinkles, like Melissa of Simply Whisked shows in her post! 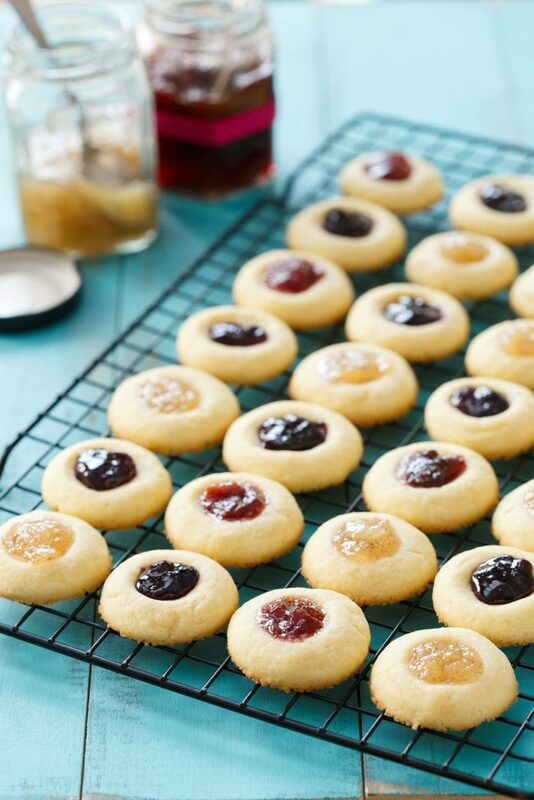 These Jam-Filled Thumbprint Cookies are perfect for little fingers – literally. Have your kiddo do the actual thumbprints for these cookies and follow behind filling with jam. Grab the recipe over at Love and Olive Oil. 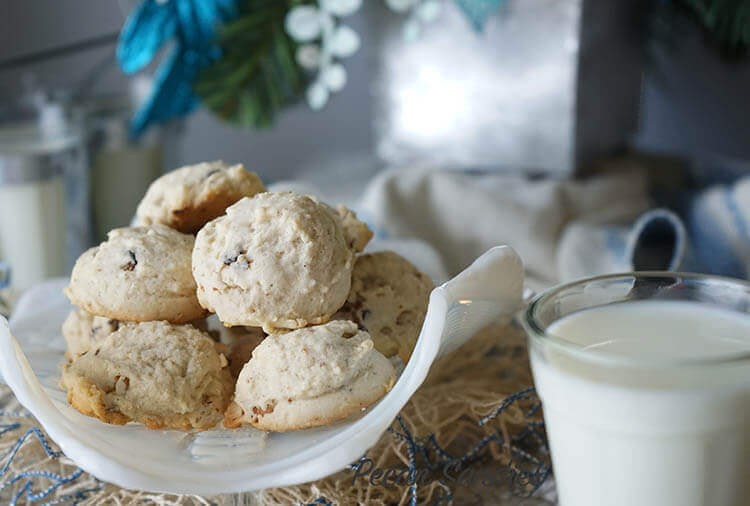 These Pecan Sandies shared by Deb over at Bowl Me Over are not only delicious, but they use a cookie scoop to get from bowl to pan! My boys LOVE playing with the cookie scoop, and it would be such a fun task to hand over to your little. I would suggest using a silicone mat that has markings for where to put the cookies OR making the underside of a piece of parchment to ensure your kiddo doesn’t scoop them all super close together. 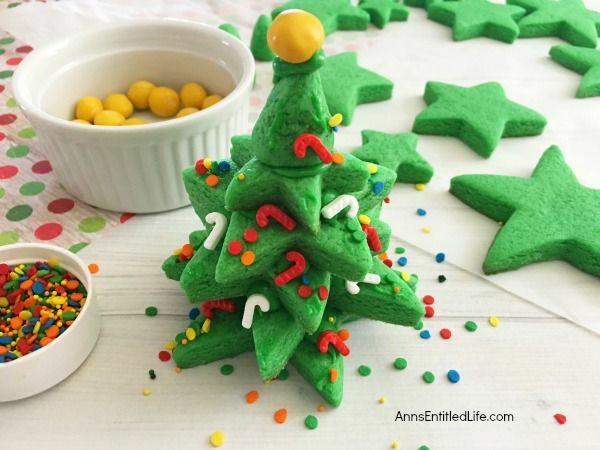 How cute are these stackable Christmas tree cookies? Not only are they so cute, but they are so kid friendly. Bake the actual cookies while your kids are at school and let them go to town with the canned frosting and sprinkles, constructions their own little cookie trees. Who hasn’t threatened their kids with a lump of coal on Christmas? 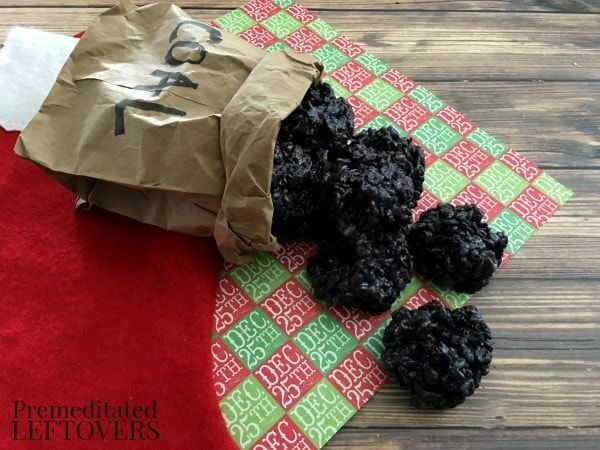 These Lump of Coal Rice Krispie treats are so cute and kids would LOVE smooshing the sticky mess together! Get the whole recipe over at Premeditated Leftovers! These cookies are a great starting point for getting your kids involved in your holiday baking and a great way to being the tradition with even the most little independent hands. 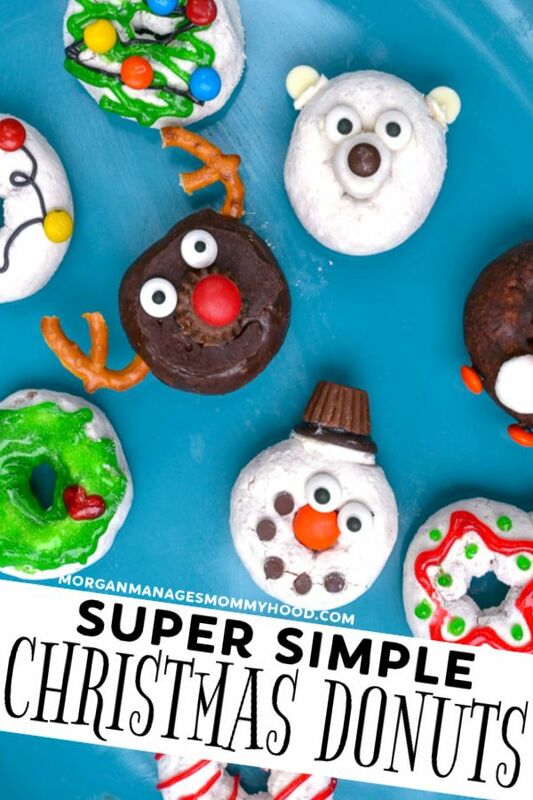 These simple Christmas treats don’t use any kind of heat or even knives – just store bought donuts and decorations. Kids will love using their creativity on these masterpieces! Okay, so tell me – what were some of your favorite holiday memories? Which of these Christmas cookies would your kiddos have the most fun making? Let me know in the comments! Need more easy Christmas cookies? Try my post of over 20 no bake Christmas treats! Want to keep it a bit healthier? Try these 15 Easy, Healthy Christmas Snacks Your Kids Will Love! Thank you so much for this post!! I have four little ones ages 3, 2, 1 and 7 months. The older three always want to help in the kitchen but I am never ready for the mess. These are perfect for them to do this week! Oh, yay!! I’m so glad. 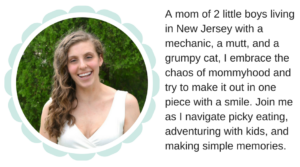 I feel you – the mess can be insane, but I definitely find that very specific tasks that can be “theirs” really helps!